A crashed ship and corporate espionage. Not an action-filled story, and no romantic arc (the main character is already in a committed relationship) - simply an engrossing, relaxed-pace mystery about a professional salvage team.Always interesting to read SF written before the internet and mobile phones really got going. Very funny the number of times people printed things out in this future world. This book suffers a two star rating for a couple reasons. First, the speculative science fiction in this book don't stand the test of time. Not only do they not stand up to 25 years of science and technology development, it's as if the author made no real effort to advance anything but just to glue odd meanings and habits on top of technologies from the time the book was written. It ends up feeling cheap and low-effort.Second, and this may be partially the fault of the first point, the characters are very difficult to become invested in. There is so much time spent explaining their use of far future technology, which frankly pales in comparison to what we can do now on a daily basis, that much of their motives and situations feel forced. Add to that a collection of quirky "polite society" memes that are never explained in any way and you have a book full of characters that are wholly uninteresting. A relatively early work in Scott's career, but still a very strong novel. Excellent, detailed and interesting world building; easily relatable, credible characters, and although protagonist Gwynne Heikki is the only one fully fleshed out and complex, others are still engaging; "info dumps" are neatly blended into the narrative without feeling intrusive; a suspenseful plot centered around corporate intrigue: keen social observation: all these combine for a very enjoyable and worthwhile read. Published in 1990, but, for the most part, it's still quite fresh. Compelling hard SF with a very strong female lead character. 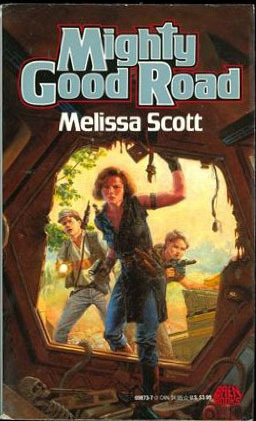 So weird to be reading a Melissa Scott novel I hadn't encountered before! A little sad how quickly her communications and software predictions have become painfully outdated, but the characters and politics are usually the more interesting parts of her books anyway. This one's pacing feels off with an extremely abrupt end, unfortunately. The plot and characters were interesting, but the world-building was too much for the story! The author spends whole pages describing what's basically a train station in intricate details. I feel like she built this whole detailed world and wanted us to know everything, but this would have been better spread along a whole saga. The story was ok. The world creation and technology were good. For me, it is the escape and being able to insert myself into the story either through the character or as an observer floating over his/her shoulder. I don't know why, but I could not connect with the characters. I'm trying to think who else has used the idea of an interstellar railroad. Of course the originator was probably Nathaniel Hawthorne with his "The Celestial Railroad." Timothy Zahn did something similar a few years later in "Night Train to Rigel." Nice read. Interesting mode of travel and characters easy to visualize. I think I read this years ago because some parts seem vaguely familiar so I would say the book is not terribly memorable. Melissa Scott - Scott studied history at Harvard College and Brandeis University, and earned her PhD. in comparative history. She published her first novel in 1984, and has since written some two dozen science fiction and fantasy works, including three co-authored with her partner, Lisa A. Barnett.Scott's work is known for the elaborate and well-constructed settings. While many of her protagonists are gay, lesbian, bisexual, or transgendered, this is perfectly integrated into the rest of the story and is rarely a major focus of the story. Shadow Man, alone among Scott's works, focuses explicitly on issues of sexuality and gender.She won the John W. Campbell Award for Best New Writer in Science Fiction in 1986, and has won several Lambda Literary Awards.In addition to writing, Scott also teaches writing, offering classes via her website and publishing a writing guide.Scott lived with her partner, author Lisa A. Barnett, in Portsmouth, New Hampshire for 27 years, until the latter's death of breast cancer on May 2, 2006.